When you use select *, it does not matter how many changes you make to the underlying tables, you do not break the selection stored procedures. I stopped for a minute to add "what about business objects", but we quickly overcame that objection.When you havethat little pesky situation where your business objects have changed (aka, always) you can code generate those bit. What about binding to the UI? Well, I have thought that one thru (yeah, it is a spelling foh pah, but get over it). Switch all of your data access to DataSets and use the "create columns" binding for your pages. In addition, remove all UI pages and forms that have elements that do not nicely fit into a DataGrid. 1. Combine all of your data needs into a single object you can simply pop on a page. User has one address, no problem. Thousands of addresses, no problem. And, you do not have to think about this. In addition, with every related table having just two columns, ID and Inforamtion (and possibly a foreign key reference), queries are simplified. 4. Make sure you have configuration files on every level of your application. Every tier needs ultimately flexibility. After all, your next assignment may be with a completely different vertical and you need to be able to take your generic architecture everywhere you go. 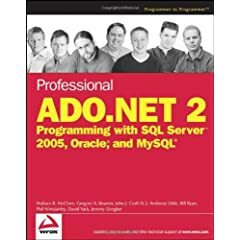 There are a couple of major problems with ADO.NET and XML: ASP.NET on the Edge. IDG became Hungry Minds and then sold out to Wiley who were really courting for Dummies. Microsoft constantly changed the technology. Anyone who remembers System.Data.ADO will understand. I was a perfectionist at the time and constantly trying to get everything perfect. Some technical editors do not know what they are teching. Fortunately, after firing a few, we found a wonderful technical editor who helped me get through the maze of book writing. I missed some deadlines. When you miss deadlines, no matter how good the reasons are, the book is late. What is writing a book on beta technology like? Imagine spending all of your waking hours thinking about a future version of the same tools you use at work. Now, picture the tools constantly changing at the whim of somebody else (most times for good reasons) and having to rewrite your content over and over again. Finally, realize you are not going to get paid much for any of the hours you have spent writing and rewriting your book. The smart authors get things working and release one of the first books, even if the product is still beta. In general, the books are not that great, but they make quite a bit of money. The next group of authors take time to write proper primers, which unfortunately sell very few books. These are fairly decent works, but have low sales figures because they did not get out first. The next step is major mental masturbation where authors spew out their own personal musings on application building as if they were inventing a cure to cancer. Some of these books truly push the envelope, although most end up in the pile of mediocrity. After this first experience, I swore I would never write a book on beta technology … again. Co-write – It is much less taxing to update a couple of chapters when the final release. Microsoft WILL change things at the last minute and it is much nicer to have a few hours of sleep before heading in to work.